Born and raised in Pennsylvania, Brett Kern began his higher education at California University of Pennsylvania in the fall of 2003 as a Graphic Design Major. However, one year into college, after discovering a love for clay, Brett decided to switch his focus to ceramics. In the spring of 2007, he graduated from CALU with a Bachelors of Fine Arts and a focus in Ceramics. Brett immediately transitioned to West Virginia University to begin his graduate studies. West Virginia would have to wait a semester though. 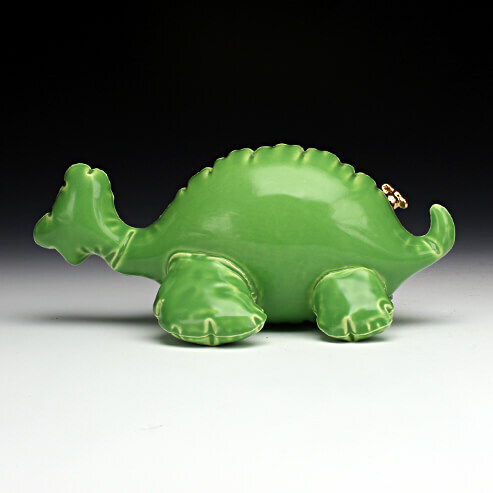 In the fall of 2007 Brett studied overseas as part of the WVU/Jingdezhen Ceramics Institute exchange program in Jingdezhen, PRC. In 2010 Brett received his Masters of Fine Arts from WVU. With school out of the way, it was time for Brett to head west to begin his career as a professional artist. What better place to start that career than the ceramics mecca that is Montana? Upon graduating from WVU, Brett was awarded a long term Artist-In-Residence position at the Red Lodge Clay Center in Red Lodge, MT. The appointment lasted from August 2010 until August 2011. However, Brett was unable to resist the siren’s song of West Virginia and returned in 2011 to begin his teaching career at Davis & Elkins College in Elkins, WV. In addition to teaching at D&E, Brett also teaches classes at the Randolph County Community Arts Center in Elkins and at the Augusta Heritage Center of D&E. While maintaining his teaching career, Brett continues to show nationally and regionally. Taylor Books in Charleston, WV and The White Room in Thomas, WV both display his art. Brett received Best in Show in the HxWxD juried sculpture show at the Rosewood Arts Center in Kettering, OH and has work in the 5th annual Beyond the Brickyard show at the Archie Bray Foundation in Helena, MT. “Something has survived,” reads the tagline for the 1997 movie, Jurassic Park: The Lost World. Undeniably, something has survived: the infatuation I have with the pop culture of my formative years, during the late eighties and the nineties. It is through these “cultural glasses” that I continue to view and interpret the world, which influences the subject matter and purpose of my work. My predilection for producing collectible objects comes from my training as a potter and my persistent preoccupation with collecting toys, pop memorabilia, and nostalgic items from my youth. Clay and glaze are essential materials for representing my often disposable and transient subject matter as what it has, to me, truly been: enduring and precious. The mold-making process allows me to cast, out of clay, authentic replicas of meaningful objects. Subsequently, I decide whether these new ceramic objects should be left as is, or manipulated to fit in with casts from appropriated commercial molds in order to subvert the object’s original intent. Glaze helps to emphasize the magnificence of the material as it flows in and out of lines and wrinkles, filling the object’s surface with a wealth of depth and variation within a simplified color scheme. Gold Luster is employed sparingly to highlight specific areas of intimate interactions we have with the objects. I find that the mold-making process imitates, in a certain way, the fossilization process. Objects are covered in a material that captures their shape and texture and this, in turn, preserves the object as a rock-like representation. Movies, television, toys and games dominated the cultural landscape of my youth. I am a product of this specific time period, and I like to think of my artwork as the fossils that will help preserve it.